Slides Toolbox is absolutely a must have Google Slides add-on for teachers and students. It provides you with a bunch of interesting features that are not readily available through Slides. Its main strength is that it allows you to conduct batch editing operations to your slides with few clicks saving you so much time. For instance, instead of having to individually delete shapes, images or tables you have inserted in your slides, you can automate the process with a single click using Slides Toolbox. These allow you to batch remove selected items from your slides. These include images, lines, shapes, charts, tables, videos, word arts, groups and many more. This is a relatively new feature which enables you to easily customize selected text in your presentation. These are tools to help you arrange selected objects in your slides. You simply select object type from the drop-down menu and apply changes you want to add. 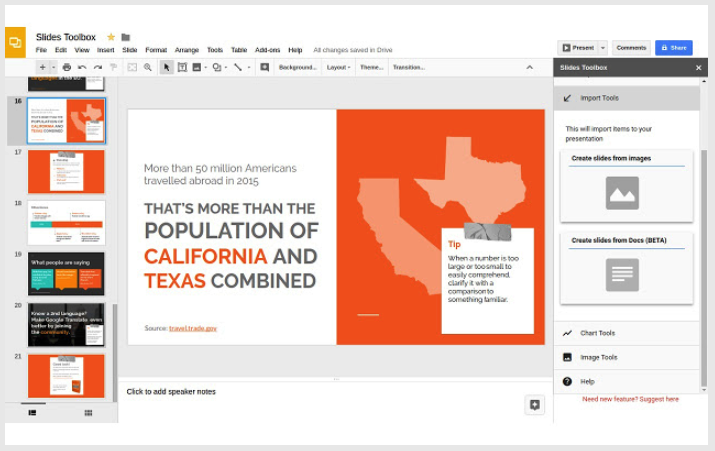 Use this feature to help you export the slides of your presentation in different file formats including JPG, PNG,or SVG. It also lets you save files to your Drive, view or download outline text, and choose to export only slide images. This allows you to import items to your presentation. You can easily create slides from images and Docs. This will enable you to 'resize and arrange images of selected slides in your presentation'. Use this feature to easily create a table of contents for your presentation.